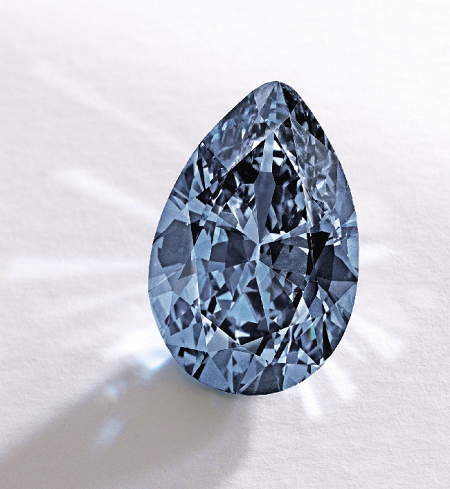 This month, Sotheby’s will be auctioning off one of the most talked about blue diamonds in recent years, the Blue Moon diamond. I expect that it will surprise us at its final hammer price, as blue diamonds in recent years have been making impressive prices at auction. Let’s take a quick look at some of the most momentous diamond prices earned at auction in recent years for blue diamonds. 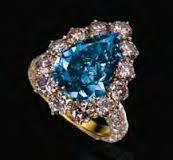 A Fancy Vivid Blue diamond was the first diamond in history to break a price at auction of over $1 million per carat. It was back in 2007, when, not one but two Vivid Blue diamonds broke that price level, the first being a 6.04 carat Fancy Vivid Blue IF clarity diamond that sold on October 8th, 2007 for $1.32 million per carat, and a 4.16 carat Fancy Vivid Blue diamond by Graff Diamonds that sold for $1.14 million per carat the following month on November 14, 2007. 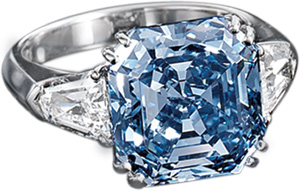 The 6.04 carat Vivid Blue diamond broke a 20 year record in 2007. 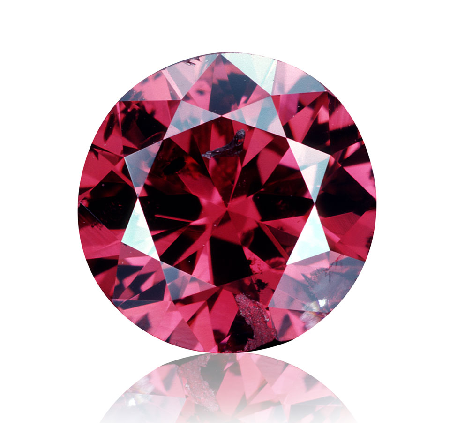 Back in 1987, the Hancock Red, a 0.95 carat round Fancy Red diamond was sold for $927,000 per carat. It was previously owned by a Mr. Hancock, who purchased it from his local jeweler for $13,500 back in 1956. 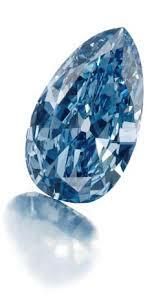 In 2007, the 6.04 carat blue diamond broke this diamond price record when it sold for $1.32 million per carat. In 2008, records continued to break when a 3.73 carat Fancy Vivid Blue diamond was sold at auction on May 15 for $1.33 million per carat. It may have sold only a hairline more than the 6.04ct the previous year, but it was a significant relative increase because of the total size. The 2008 diamond was only a 3.73 carat in size, in comparison to the 6.04 carat that had sold the year previous for slightly less (and was over 5 carat in size). 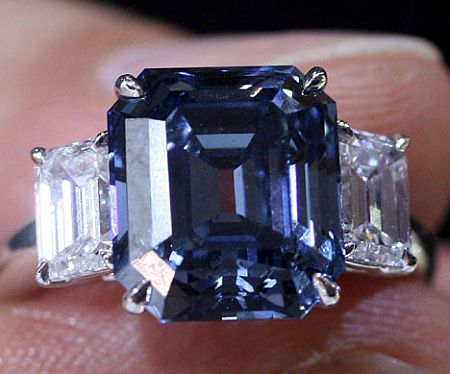 When comparing to the Graff Fancy Vivid Blue diamond of 4.16 carats, it made a 17% gain in value (a 34% annual increase in price). During that same time period, the Dow Jones had decreased by 2%, and it did even more so the following 6 months during the Real Estate financial crisis. The Nasdaq had plunged by over 4% and the S&P 500 was down by over 3%. 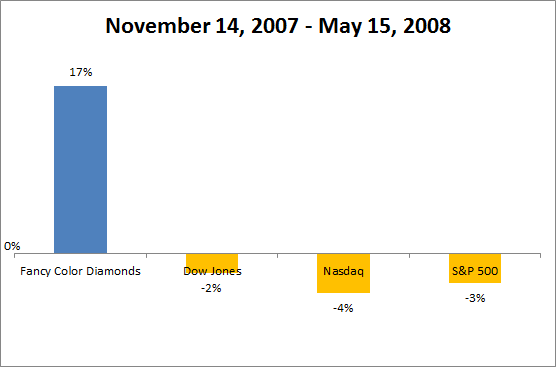 In 2009, records continued to be broken by Fancy Vivid Blue diamonds, when a 7.03 carat Fancy Vivid Blue IF clarity diamond was sold for $1.35 million per carat, a further 1.5% increase over the previous record, holding prices comparatively steady while simultaneously during that same one year period, the Dow Jones had plunged 34%, the Nasdaq had gone down by 32%, and the S&P had decreased by a whopping 36%, all following the major financial crisis of 2008. We can only conclude that investors were looking for real assets to hold their wealth and capital for them. This is just 1 case of many more examples where even real estate could not hold its value during financial crisis, but color diamonds did. 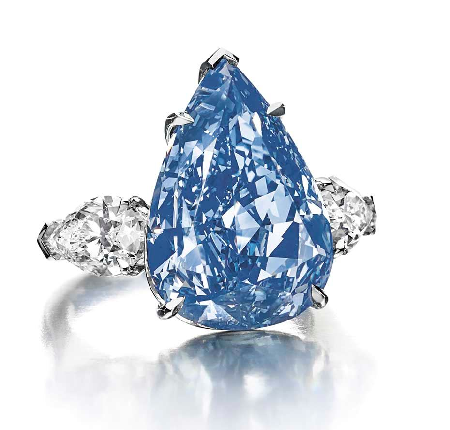 A 10.95 carat Fancy Vivid Blue diamond was sold in 2010 for $1.44 million per carat on October 1. 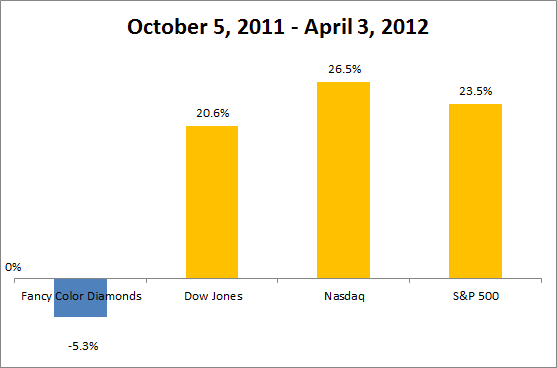 During this period, the price of Blue diamonds had increased by a further 6.7%. Additionally, by this time, the S&P had gained back 26% of its losses, the Dow Jones gained 27% and the Nasdaq came back the strongest with a 38% gain. In 2011, Fancy Vivid Blue diamonds made further increases in valuation, when a 6.01 carat Fancy Vivid Blue diamond sold for $1.69 million per carat on October 5th, creating a further 17.3% increase in value during the period. The Dow Jones made a 1.02% increase and the Nasdaq created 3.8% value but the S&P made a hairline loss at 0.2%. 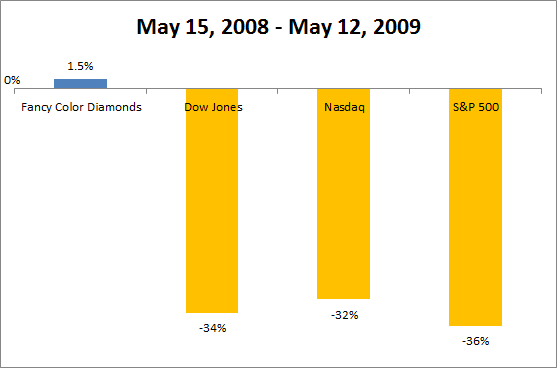 I would like to point out at this point that none of the indices recovered back to their May 15, 2008 values that we analyzed above. Fancy Vivid Blue diamonds took a slight breather in 2012 after such a long ride upwards, when a 8.01 carat Fancy Vivid Blue diamond sold for $1.6 million per carat on April 3; a decrease of 5.3%. 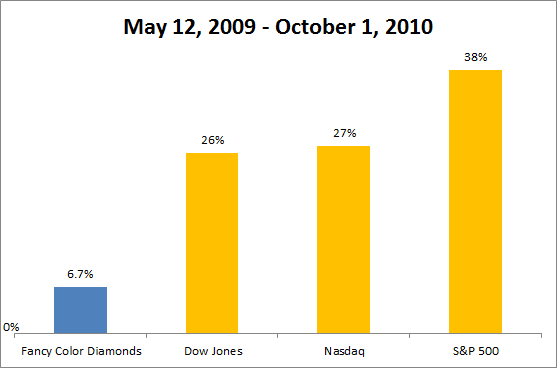 During this time, the S&P gained 23.5%, the Dow Jones gained a further 20.6% and the Nasdaq gained 26.5%. For the first time in 4 years since the 2008 crisis, the 3 indices gained back their value. In 2013, Fancy Vivid Blue diamonds continued their descent when a 5.04 carat Fancy Vivid Blue diamond sold for $1.32 million per carat, making a further 17.5% loss during the period in review (sold on November 13, 2013). 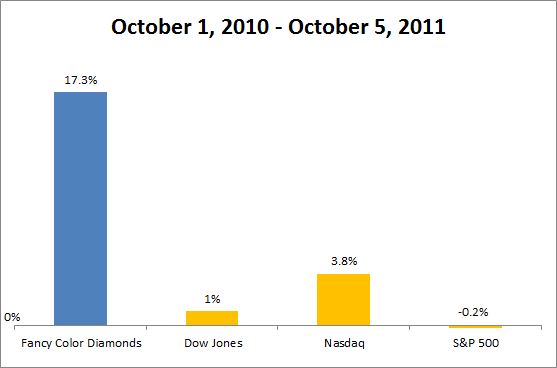 The S&P went up by 26%, the Dow Jones by 19.9% and the Nasdaq went up by 27.4%. 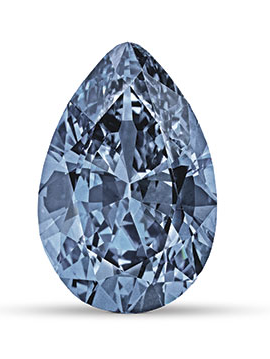 2014 marked a major comeback for Fancy Vivid Blue diamonds, when two records were broken. 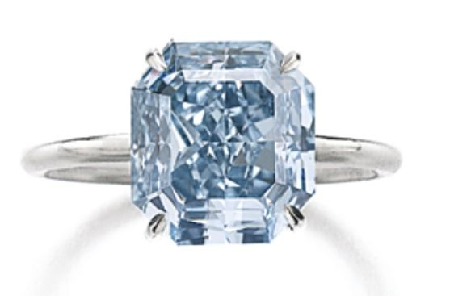 The first was the 13.22 carat Fancy Vivid Blue diamond named the “Winston Blue”, which sold on May 14, 2014 for $1.8 million per carat, followed by the 9.75 carat Fancy Vivid Blue diamond named the “Zoe” that sold on November 20, 2014 for a “modest” $3.35 million per carat. This created a 153.8% price gain. 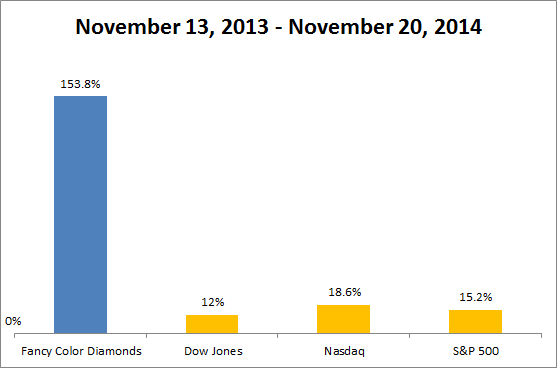 The Dow Jones increased 12%, the S&P went up by 15.2% and the Nasdaq increased by 18.6% during the same period. 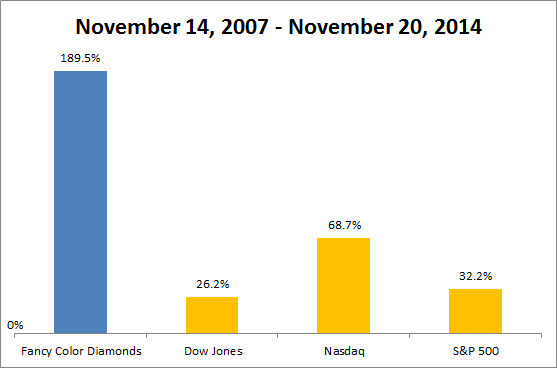 In a quick overall review from our research that spans from October 8, 2007 and up to November 20, 2014, the S&P gained 32.2%, the Dow Jones only gained 26.2%, and the Nasdaq was a strong performer at an overall performance of 68.7%. Fancy Vivid Blue diamonds made an overall gain of 189.4% demonstrating that over a longer period of time, Fancy Color Diamonds are the top performer, but more importantly, consistent in wealth preservation. 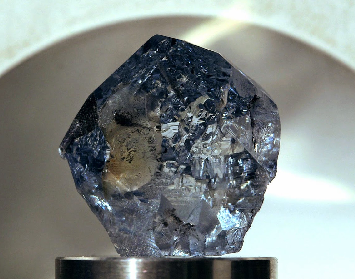 1) The rough of this diamond was sold at $25.5 million to Cora International. 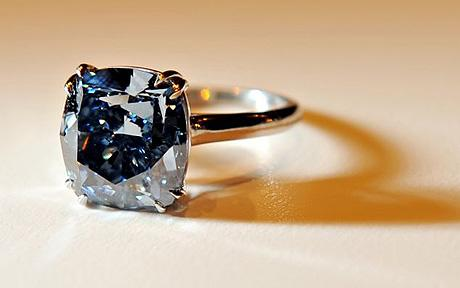 2) “Zoe”, which had the same grade sold for $3.35 million a carat, and stands below 10 carat in size. 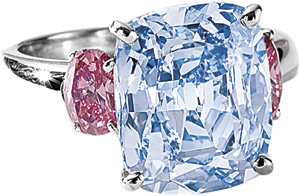 3) At $46.2 million total it would break the last overall price paid for a fancy color diamond. 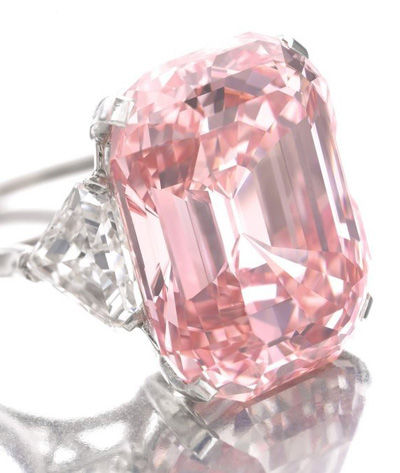 Back on 16 November 2010, Laurence Graff paid $46.16 million for the 24.78 ct Fancy Intense Pink diamond, he went on to cut it into a 23.88 ct Fancy Vivid Pink. It all remains to be seen…. What do you think will happen with the Blue Moon? 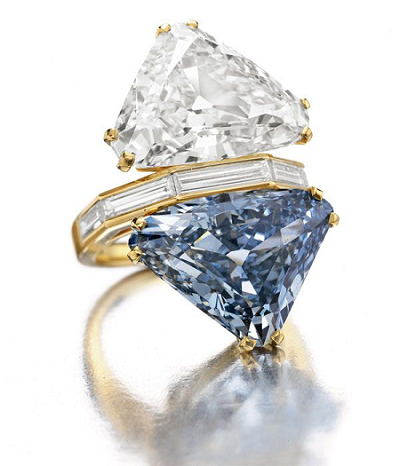 Are blue diamonds going to continue this trend, or have they reached their peak? 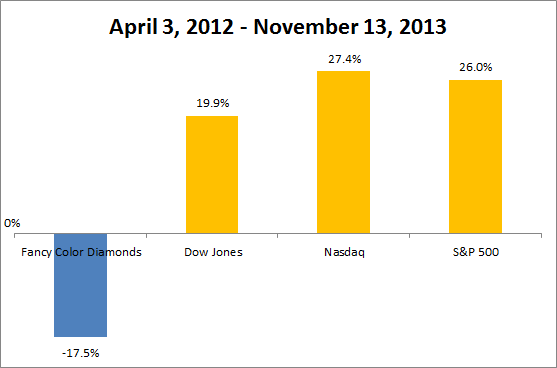 Why Do Investors Want Fancy Color Diamond Prices to Fall?